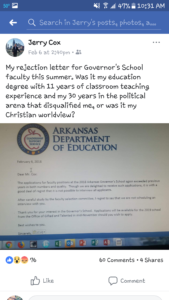 As first mentioned by the Arkansas Blog, it seems that everyone’s favorite leader of a local hate group, Jerry Cox, applied for a teaching position at this year’s Arkansas Governor’s School and was not hired. 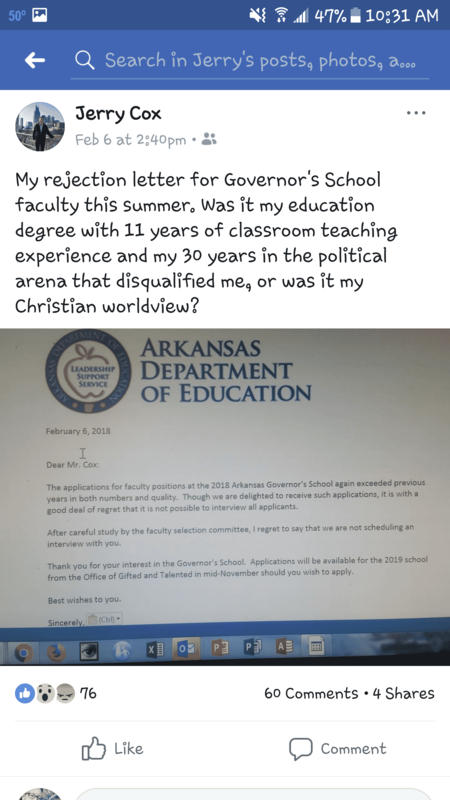 Because he is cut from the same cloth as Jason Rapert (R-Martyrdom), Cox immediately assumed that he was not hired because of his “Christian worldview,” since–OBVIOUSLY!–his “11 years of classroom teaching experience” made him a good choice. A few things jump out there. Jerry Cox really loves saying “world view.” I counted five versions of the phrase on that application alone. Cox was applying to teach either Social Science or Personal and Social Development, and the thought of him teaching the latter subject area is the kind of hilarity I needed on a gloomy Friday afternoon. Cox listed U.S. Rep. Bruce Westerman (R-AR4) as a reference, which is the kind of name dropping that makes the whole thing feel weird. Well, when you’ve got a few graduate-level classes from 35 years ago, 11 years of high school teaching back in the Reagan Administration, and a resume that mentions both abortion and “Jerry enjoys photography, fishing, and collecting antiques,” how could the AGS not hire you? I mean…unless they received applications from people who were far more qualified to teach in this setting. By my count, those applications include 10 people with Ph.Ds, four people who are in the process of getting their Ph.D, 11 people with Master’s degrees, two people who are close to completing a Master’s degree, seven people with Bachelor’s degrees, and one person who is about to get her Bachelor’s degree this Spring. 1. A student forum on how world view impacts culture. 2. A student forum on how various world views are impacting society. 3. A student forum with invited guests who are experts on various world views. Wow. Jerry Cox is a regular John Amos Comenius, revolutionizing modern education with his ideas. It is almost like he thought his name recognition and his fancy Westerman reference would be enough to get him a job for which he was far less qualified than other applicants. Not that he would ever admit that, mind you. Such introspection and critical thinking is well beyond Jerry Cox’s abilities. It’s much easier–and more persecute-y–to just assume that you weren’t hired because of your “Christian worldview” rather than because you were one of the least-qualified applicants in the pool.